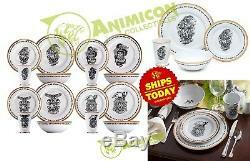 A set of 4 place settings - dinner plate + salad plate + bowl + cup. 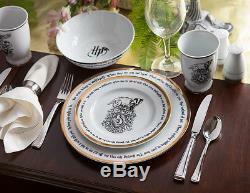 One place setting for each house - Gryffindor, Hufflepuff, Ravenclaw, and Slytherin. Ensure everyone gets to meals on time to secure their proper house. Mix'em up to cause complete chaos. 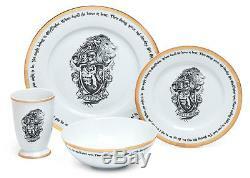 Cups (on both sides), dinner plates, and salad plates feature an illustration for the particular house. Dinner plates, salad plates and bowls are edged by an intro from the Sorting Hat and then the couplet for the particular house. Care Instructions: Not dishwasher safe. Dinner Plates - 10 1/2 diameter. Salad Plates - 8 diameter. Bowls - 7" top diameter x 2 1/2" tall. Cups - 4 1/2" tall x 3 1/4" top diameter. Includes 4 dinner plates, 4 salad plates, 4 bowls, and 4 cups. ALL ITEMS COME FROM A. PET-FREE & SMOKE -FREE HOME. 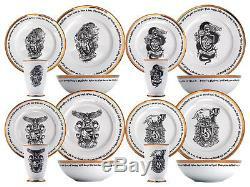 The item "HARRY POTTER HOGWARTS HOUSE 16 PIECE DINNER SET Dinnerware Dishes Ceramic 2018" is in sale since Thursday, October 18, 2018. This item is in the category "Home & Garden\Kitchen, Dining & Bar\Dinnerware & Serving Dishes\Dinner Service Sets". The seller is "animicon" and is located in Orlando, Florida.